A bright red background and shaking fives. 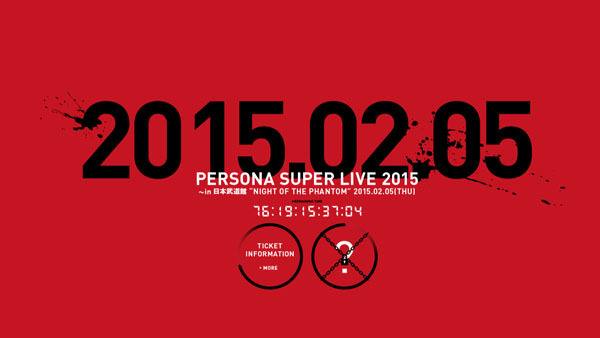 Atlus has announced “Persona Super Live 2015 in Nippon Budokan: Night of the Phantom,” a concert event featuring music from Persona 3 and Persona 4 set to be held on February 5 in Chiyoda. The event will feature performances from Yumi Kawamura, Lotus Juice, Shihoko Hirata, Atlus’ Shoji Meguro, and others. General admission is 8,000 yen, and premium tickets cost 16,000 yen. It has a bright red background (the color theme of Persona 5). When the page first loads, the date loads similar to a countdown, but the two fives come in first and briefly stand on their own. The two fives in the date continuously shake afterward. Give us more Persona 5 news, Atlus. You’re making us report on shaking fives.